At Simonsen Dental, we will make sure you receive the best ongoing care, provide thorough dental exams and keep you informed about your teeth, gums and mouth. We invite you to learn more about the dental services we offer at our Beaverton, OR dental office. Our preventive treatments include exams of soft and hard tissue of the mouth as well as routine dental cleanings, x-rays and patient education. We can strengthen your teeth with fluoride, sealants, and MI Paste. 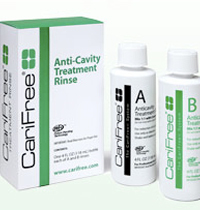 We have also incorporated the CariFree system (as pictured) and DIAGNOdent laser to better serve our patients. We will assess your situation and suggest specific procedures to best restore your oral health. If you need a crown or filling, we will talk to you about options, including porcelain, gold, composite and amalgam (silver). We will let you know the different advantages to certain treatments and the difference in price so you can make the best decision for your needs. Should your specific needs require a specialist, we will refer you to some of the top practitioners in the area, ensuring that you receive the most complete care and best possible outcome. Our restorative treatments include fillings, veneers, crowns, bridges, implants, root canals, dentures and TAP appliances. • What Is Root Canal Therapy? We care more about what is right for you than about current trends. We will talk with you about your cosmetic concerns and options for addressing them. Insurance companies do not cover most cosmetic work, but we will discuss costs with you to help you make a final decision. Our cosmetic treatments include tooth whitening, all-porcelain crowns and veneers, implants and tooth-colored fillings. Urgent Care: If you have urgent dental problems requiring root canal therapy or extractions (removal of teeth), Dr. Simonsen may be able to help. Call us today! Did you know? The biting surfaces of teeth have grooves which are suseptical to decay. Teeth can be protected by applying sealants to fill in those grooves. Every patient's dental needs and concerns are different. At Simonsen Dental, we place a high value on helping you maintain a beautiful smile and great oral health. The two major causes of tooth loss are decay and gum disease. Together, Dr. Simonsen, his staff and you will design an individualized treatment plan to help you optimize your oral health. Our preventive treatment includes getting your mouth into a good condition here in our office and, to help keep it that way, developing a maintenance plan for you to follow at home. The ADA recommends that patients see a doctor and hygienist every 6 months and more often if they have periodontal disease. However, optimal frequency varies from patient to patient; we make recommendations based on each individual's needs. Did you know? Food and drinks that contain acids or sugar can contribute to tooth decay. If you reduce how often you have these foods, you can achieve a healthier mouth, as well as improve your overall health. Aim for a healthy, well-balanced diet that's low in extra sugars and acids.